OEM specified. Locks and seals threaded fittings. Resists leakage, vibration loosening, moisture, hydraulic fluids and diesel fuels. 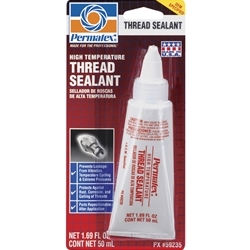 Lubricates threads for easy assembly and disassembly. Won’t shred or wear like thread seal tape. Parts may be repositioned up to 4 hours after application. Temperature range from -65°F to 400°F (-54°C to 204°C). Contains PTFE.